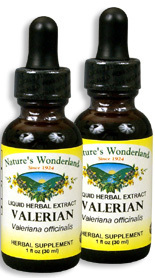 Valerian Extract, 1 fl oz / 30 ml each (Nature's Wonderland) - Penn Herb Co. Ltd. Smooth out the rough edges of your hectic days with Valerian. The relaxing root strengthens the nervous system to help you better cope with stress and quiets the busy mind to promote deep, restful sleep. DID YOU KNOW: During the air raids of World War II, Londoners used Valerian to help them fall asleep? ALSO KNOWN AS: All Heal, Valerian. AMOUNT PER SERVING (500mg/ml or 30 drops): Certified Organic Fresh Valerian Root (Valeriana officinalis). OTHER INGREDIENTS: Grain Alcohol (60-70% by volume), Deionized Water. Free of: milk, dairy, egg, fish, shellfish, tree nuts, peanuts, wheat, gluten or soy. Relieves occasional sleeplessness; stress, tension & nervous irritability; menstrual cramps; relaxes muscles; minor musculo-skeletal discomforts. NOTE: Herbalists do not recommend using Valerian together with prescription sedatives or antidepressants. 30-60 drops in water or juice, 2-3 times daily or as needed. Shake well before using. NOTE: Herbalists do not recommend using Valerian if you have severe depression or taking prescription pain killers.